Remember a few posts back, I was posting a bunch of Malaysian recipes because I was having a ginormous Penang food cookout at home? This is one of those recipes and the last of the recipes from that event. 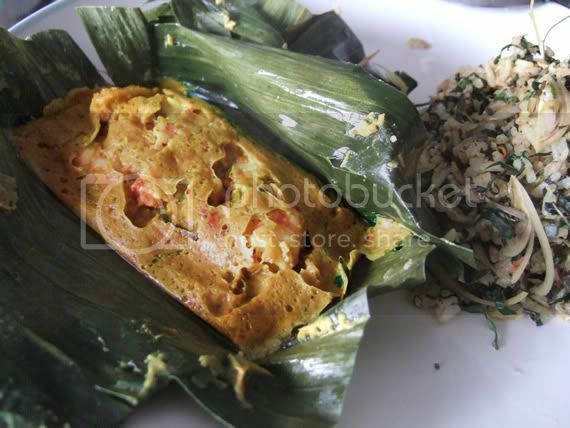 Otak-otak is a Malaysian fish custard steamed with a spice paste wrapped in banana leaves. The type of fish used are usually white meat and firmer so they do not fall apart too easily; monkfish, halibut, cod, seabass and the likes. There are also variations of this recipe using other types of seafood – this is one of those variations using shrimps. The spicy custard is key in making this delicious and also a certain kind of leafy herb called Daun Kadok or Piper sarmentosum. The locals in Malaysia sometimes substitute this herb for mint leaves because Daun Kadok has a rather minty profile but by substituting it with mint leaves, the minty profile is pretty much all you get because Daun Kadok also has a lemongrass and a green herbaceous profile that cannot be replicated. But in the event that you could not find this herb, go ahead and use mint. It would still be pretty good. So, the French have their pates and terrines, the Malaysian have their Otak-otak and it is absolutely delicious to eat when spread on toasts, crackers and even with a steamy hot bowl of rice. 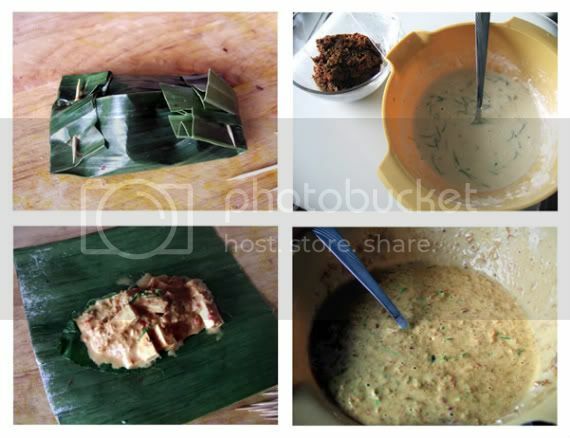 To make otak-otak, there are basically three steps 1) POUND 2) ASSEMBLE 3) STEAM – and on we go. To assemble – mix the pounded spice with all the custard ingredients very well. A creamy, rich yellow batter will result from all the mixing and you’re one step away from steaming. To steam – take a sheet of banana leaf, softened in boiling water first, and lay 2 daun kadok at it’s base. Add some shrimps or fish in the center of the leaves and ladle approximately 1/4 cup of the custard batter. Slowly bring the sides of the banana leaf up and form a pouch, tucked safely with a toothpick. Repeat until the batter is all used up. If you do not have banana leaves, you can also use aluminium foils as well – just oil it a little bit before assembling all the ingredients in. Steam the banana leaf pouches in a steamer for 15 minutes. It’s ready to eat with some rice or with a slice of toasted baguette. Mmmm…. Vegetarians – you can omit the fish paste in the custard and also substitute shrimp with medium soft tofu. It is equally delicious. Ooooo that looks good. Definitely something I will try out when I get my new appliances next week. judy: Yea, it's one of my favorite things to eat. Let me know how it goes when you try it out. Elaine, the Otak-otak looks delicious, but the RICE is the one that draws my attention. Is that the same Nasi Ulam recipe you posted earlier? Lingy: Yes, it is. I had the otak-otak with leftover nasi ulam the next day. This looks sooo good, thanks for posting this recipe!!! I'm also into the food blog world, and it would be great if you can take a look at my site and leave me any comment/suggestion. Take care and keep posting!